The conversations that occur in Cinema and Experience are primarily about film. Firstly, there are the individual films, filmmakers, film movements, and film theories that Kracauer, Benjamin and Adorno responded to. Secondly, there is film understood in the broader framework of the history of modernity. In this latter context, Cinema and Experience discusses the philosophical and political positions these authors had, including how they analysed historical events such as the formation of industrial capitalism and mass culture. It also addresses their reflections on a range of cultural phenomena. For Kracauer, Benjamin and Adorno, cinema was entwined with different aspects of modernity, not only in the sense of relating to other technological media like photography but also in terms of being symptomatic of developmental tendencies within history. Moreover, for all three writers, mediums like film were giving rise to new forms of perception, experience and memory. What Hansen has to say about Adorno’s engagement with cinema is particularly important given the considerable body of Anglophone-literature that already exists on Benjamin and, to a lesser extent, Kracauer’s film writings. Rather than simply address Adorno’s polemic against cinema in works such as Dialectic of Enlightenment (co-written with Max Horkheimer), she explains how to approach little known essays like “Transparencies on Film” ­– Adorno’s broadest and most positive statement on the possibility of cinema actually having an aesthetics. She also draws out certain strands from the margins and fissures of his writings on mass culture and modern art, particularly music, to construct a series of interconnected propositions that give his underdeveloped film aesthetics a more coherent texture. In doing this, she shows how Adorno’s direct and indirect thinking about cinema has to be understood in relation to an array of complex concepts, including particular uses of terms such as technique (Technik), technology (Technologie), writing (Schrift), and natural beauty (Naturschönheit). Hansen reaches the compelling conclusion that Adorno’s work “still contains valuable impulses for film theory, critical analysis, and creative practice”. In addition to gleaning – from the different layers of meaning in Kracauer, Benjamin and Adorno’s work – models of thinking on cinema that can be usefully related and juxtaposed against each other, Hansen also sets out to ask whether the work of these writers can be applied to moving image culture as it changes in response to digital technologies. She suggests that “the vast proliferation of films across digital storage devices and distributed media, diverse platforms, and smaller and smallest screens has been challenging our assumptions about what we mean by cinema” but that such challenges have motivated her to want to re-open “ostensibly closed chapters of film theory” (xvii) in order to re-examine a number of key concepts in cinema studies. 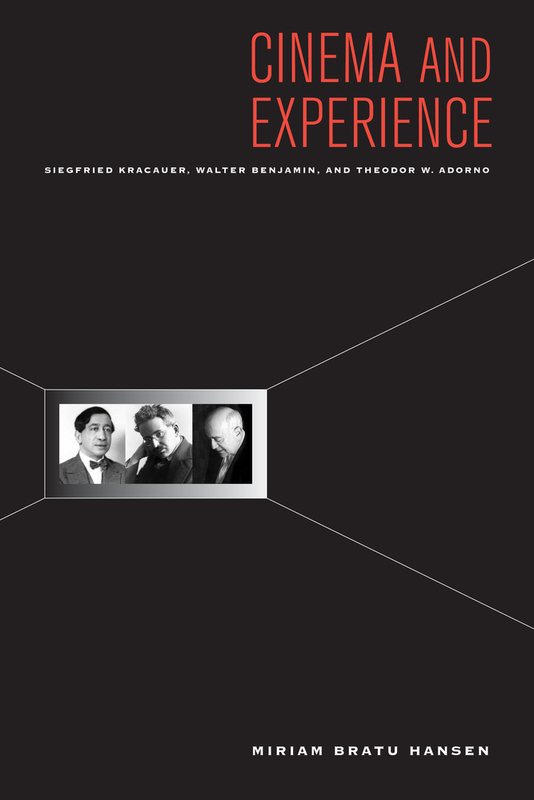 While the book fails to fully engage with the question of how relevant the thoughts of Kracauer, Benjamin and Adorno are to today’s rapidly changing media landscape, it nonetheless provides a solid foundation for any future engagement with such a question. Moreover, the book builds on earlier work Hansen has done analysing modes of spectatorship in regard to silent American cinema and the dynamics of public reception and consumption – Babel and Babylon: Spectatorship in American Silent Cinema – and it also adds to the essays she has written on the concept of “vernacular modernism”, a term that explains how classic, Hollywood films mediated, articulated, and reflected upon the contemporary conditions of modernity. As Tom Gunning has put it: “Hansen was able to work out an intersection between film history, film analysis and film theory few have ever matched” , an intersection that is evident in Cinema and Experience. Tribute to Miriam Hansen, Monday, February 07, 2011, http://www.cmstudies.org/news/58161/ accessed, June 16th, 2012.